I am obsessed with fall and winter: despite not being a huge fan of the cold, I can get with it for all of the festivities the winter months bring. The one thing I can’t get on board with? It seems as though everything in this giving season costs money. Every time I turn around, there’s an event at work to chip in for, a gift that needs to be purchased, or some elaborate meal that means big bucks coming out of my tiny budget. Don’t get me wrong, I love giving to others and creating a culture of generosity in my household when it matters, but I am notoriously frugal and that belt-tightening feels nearly impossible at the holidays. 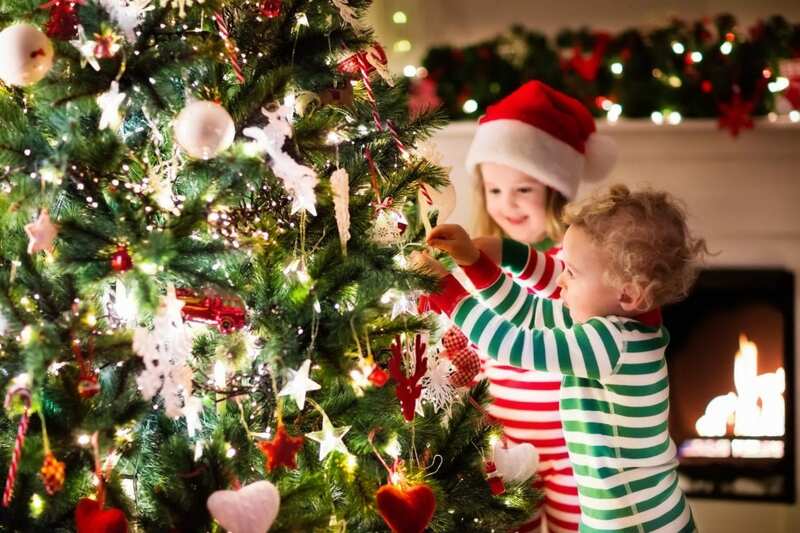 One thing I’ve never wanted to skimp on is creating a magical atmosphere and family Christmas traditions for my daughter during the holidays, but that can be rather hard to do when trying to save money. What’s a mom to do when it comes time for creating lasting memories with family on a budget? In an effort to bring jingle bells to my home without losing my own pocket jingle, I embarked on a plan to create new and wonderful family Christmas traditions for free or next-to-free. Who says creating holiday joy has to break the bank? This season I’m focusing less on gift giving and money spending, and more on creating meaningful family Christmas traditions. This is actually something my husband and I began doing at our first married Christmas, and have enjoyed immensely ever since! We both seek out ornaments that we feel represents one another; there are some truly kitschy ornaments out there, after all, and we’ve both had great fun in selecting sweet and silly mementos for one another. We typically do the exchange when we decorate our Christmas tree, and it is almost as anticipated as other seasonal highlights! If you’re the kind that likes a smattering of collected ornaments on your Christmas tree, this is a fun and frugal way to kick things off with a little holiday cheer. Every family has a cause that is especially close to their hearts: for our family, that means volunteering at our local domestic violence shelter for women and children. Though many organizations see an uptick of volunteers and donations around the holidays, this is a great time to show your children how to live generously and what the holiday season is truly about: creating a community that is unified in love, grounded in hope, and anchored by peace and joy. Find a local animal shelter, food bank, or nursing home to visit to make your heart feel light. Okay, not really. But, everyone likes to feel in charge every now and then! Have your spouse or kiddos select a reasonable snack and movie in this festive holiday season, implementing the rule that the movie must be lighthearted or otherwise around the theme of the Christmas season. Though my husband has found some clever ways to bend the rules for the movie guidelines to watch an action movie once or twice, we’ve found this is a great way to be inclusive and help everyone in the family feel as though they’re helping to make Christmas magic. Bonus points if they find one that is already on Hulu or Netflix so you don’t have to buy or rent it! Pop some kettle corn, give your littles some special hot chocolate, and snuggle up for quality time. This is a fun one to do with coworkers or close friends! Cookie swaps are SO much fun, and are an easy way to spread a little Christmas cheer. Invite a group of family or friends to participate, and have each person make enough of one kind of cookie to share. You’ll all get to sample the treats, then trade and package them in appealing assortments. Everyone leaves feeling the love and holiday spirit! Foolproof recipes are my go-to, (like this one for “Christmas Crack!” and a container from the dollar store seals the deal for my cookie exchange. I always hope to control myself around the goodies my friends come in with, and I almost always fail. I’ve never been so happy to lose. If you’re counting down the days until Christmas, doing so with the use of chocolate or small treats can’t hurt. An advent calendar begins on December 1st, and has small boxes or doors to be opened each day. I’d like to see some Elf on the Shelf delivery chocolates on the daily–and, since I am meant to be the magic behind the Elf, it’s unlikely that I’ll remember. Advent calendars are a fun and festive way to make your cheer off the charts this year. Besides, they make wine calendars for adults: and I could totally get on board with that.